The front of the house has a traditional old time front porch and at the rear of the house there is a private deck overlooking the creek. 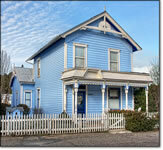 Much time and thought has gone into the restoration of this victorian house. 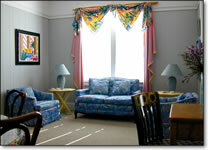 The guest's comfort is of foremost importance and the house is equipped with both central heat and air conditoning. Through out the house, I have displayed many of my own antiques. This gives it a style that is both fresh and distinctive. The spacious living and dining rooms are furnished comfortable with large pieces of vintage furniture covered in colorful prints. The smart, black and white kitchen is fully equipped with all the essentials necessary for any type of cooking or entertaining. In addition, there is a good-sized laundry room. The two-story house has three bedrooms. 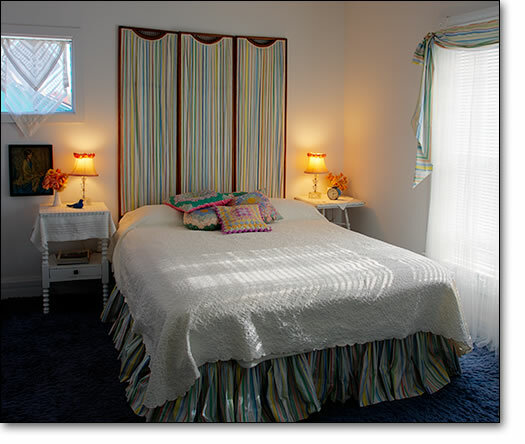 Downstairs, there is a twin-bedded room; upstairs, there is a queen-sized bedded room and a double-bedded room. There are two full-sized bathrooms - one on each floor. The house will adequately accommodate six guests.